I coach students preparing for MathCounts and the AMCs, and I teach using curricula published by Art of Problem Solving. If you notice that and both have a factor of then the fraction is much easier to evaluate. To finish out this problem we can find the prime factorization of and match that up to the product of consecutive integers. But how to turn into ? It turned out he had a lot of interesting ideas. “How about we subtract from both sides?” he suggested. Those of you well-versed in algebraic manipulations can foretell that this will lead you farther away from a solution. But rather than cut him off and tell him this is wrong, I went along with it. Well, that didn’t work. It turned out my student had many, many creative approaches to isolating n and solving this problem, none of which got us closer to actually solving the problem. But rather than cutting him off and prematurely telling him he was wrong, I went along with the playful exploration. This approach of “try it and see if it works” experimentation is something we want to cultivate in our students, not just in math, but in many academic fields. Eventually he remembered that we could divide both sides by 11 to solve the problem. While this sort of discovery approach can be inefficient and tedious, it’s fun to pop into a rabbit hole occasionally. My hope is that in the future, if he sees another problem like this, he won’t panic, but will instead try to reason it out, just as he did when he learned it for the first time. The question asks for the difference between the average time and 10 minutes. While one could find the average of the 3 times and then subtract from 10 minutes, a more clever approach (using smaller numbers) is to average the 3 differences from the start. Since , . The other time differences are and . The sum is and the average is Smaller numbers means quicker, more accurate calculations. By mixed up, I mean we have the periodic sine curve equated with the monotonically increasing log function. Often with logs we can replace them with an exponential function, in this case with base 2, but that looks messy. The approach I often see with these mis-matched functions is to draw a graph and see where the 2 functions intersect. But first, I’m going to multiply both sides by 5 because who likes fractions? Ah that’s better. Notice that the maximum and minimum values of occur when and , and the maximum and minimum values are 5 and -5. And of course this is a periodic function that is defined for all real numbers. on the other hand is defined only over positive reals, and since it is always increasing from left to right, at some point the value of the function will exceed 5. Specifically, this will occur for . Likewise, will be less than -5 for . And it’s apparent that in the interval the log function is going to intersect the sine function as it goes up and down on its periodic path. How many times does it intersect? AIME writers like to catch students on “off by one” errors, so take care to examine what is happening close to and before entering your answer! The best way to prepare for any test is to locate old versions of the exam and practice with those, especially studying the problems you answered incorrectly. This is true for the AMCs and MathCounts. AoPS also offers online prep classes. For those of you who prefer learning from textbooks, here are few recommendations. These books take problems from old competitions and organize them by topic so you can ramp up your skills. 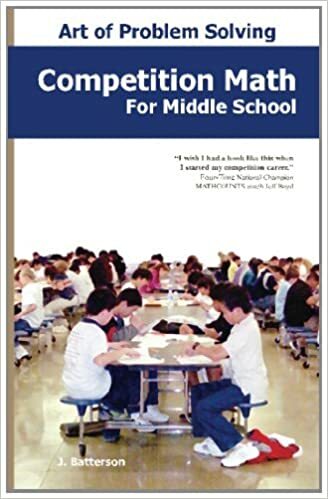 Competition Math for Middle School by J. Batterson. In particular I enjoyed the chapters on counting and probability for their concise and clear introductions to the subjects. You’ll be up to speed on these topics in no time. Other chapters are algebra, geometry, and number theory. 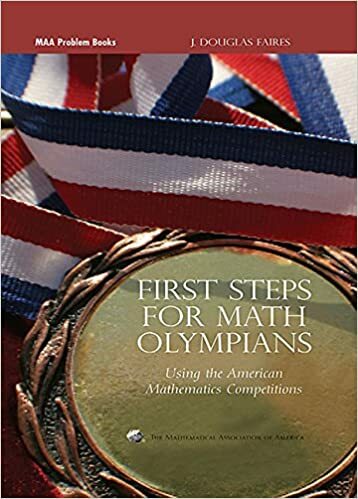 First Steps for Math Olympians by J. Douglas Faires. This is the next step in difficulty is preparing for the AMC 10/12. This book uses questions from those exams as exercises. Content includes: ratios, polynomials, functions, triangles, circles, polygons, counting, probability, primes, number theory, sequences and series, statistics, trig, 3D geometry, logs, and complex numbers. 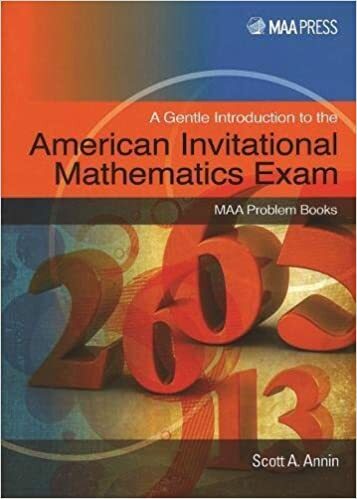 A Gentle Introduction to the American Invitational Mathematics Exam by Scott Annin. This title seemed to be speaking to me. I qualified for AIME my senior year of high school, but bombed the test, so I’ve been living in fear of the AIME every since. I’m working through the chapter 1 and I’m pleased to find myself actually solving some problems without assistance. Contents include: algebra, combinatorics, probability, number theory, sequences/series, logs, trig, complex numbers, polynomials, plane geometry, and 3D geometry. Nearly all exercises are former AIME problems. Lately I’ve been finding myself sending a one link to many parents who want to learn more about math education in the US. So I thought I’d share it here as well. This is a talk Richard Rusczyk gave at the Math Prize for Girls a few years ago. It’s very long, but the link should take you to 6:41, and the most interesting slide in the presentation. But if you want to save more time, I’ve actually transcribed that portion of the talk, just because I think it’s so important. I think some parents are so focused on getting in to some famous college, that they miss the more important goal of a college prep curriculum: actually preparing our students for college level work. The great thing about focusing on building skills, rather than building an impressive resume, is that at whatever college your students ends up, famous or not so famous, they will be more likely to succeed and excel.